Don’t like Jolly Ranchers or hard candies in general? Then this review isn’t for you. Me, I love them. In fact, I can’t remember a time when Jolly Ranchers weren’t part of my candy world. Back in the day-which is the 70’s and 80’s for me- Jolly Ranchers came into my tummy via the sticks. Or as they call them now, “stix”. The stix had a cornucopia of flavors, not just apple and cherry like they make available today. There was grape, raspberry, pink lemonade, fruit punch, and of course, the zany “fire” (cinnamon). Truly, I loved these and wished they all still existed. Sucking on those planks was an all afternoon activity, and they were cheap! I remember them as low as a dime a stick. Now? Now we have the aforementioned stix, but what everyone’s accustomed to seeing are the individual candies. People must love them, because they’re everywhere. Offices, rental car agencies, every grocery store you go to, etc. Little gems of cherry, green apple, watermelon, the ubiquitous blue raspberry, and the flavor everyone loves to hate (but us), grape. Now we have a new selection: Fruity Bash. I was really excited to try these, because new flavors make me happy-and these seemed right up my alley. In the bag, we get orange, strawberry, mountain berry, lemon and pineapple. The strawberry didn’t work for me. There’s a muted aspect of the flavor that didn’t pop enough for me- and Jolly Ranchers are supposed to pop. It was almost…oily in a way. Not great. Orange was ok, it’s definitely orange, but I have a similar note about that one-I wanted something zingy to feel “right” in comparison with the other flavors. It was just mediocre. Mountain Berry is where things start to get interesting. It has a generic berry wash with raspberry aftertaste, and me likey. It’s got enough going on to make it feel relevant. Also, raspberry is a wonderful flavor that needs more air time. There’s something familiar and something new about this one, and that’s pretty cool. Pineapple if truth be told, was the main reason I bought the bag. I love pineapple flavored candy, and this doesn’t disappoint at all. It has an acidic pineapple taste that’s just the right amount of floral-it’s great. But the superstar of this bag is the revived from the dead lemon flavor. Lemon used to be part of the normal variety of individual hard candies a loooooonng time ago. And I’m thankful that it’s back, because it might be the best lemon hard candy ever made. It’s perfectly balanced between sweet and sour and absolutely tastes like a lemon. I love these, and it’s worth noting that they’re now sold in bags of just lemon as well. Sometimes things work out. If I saw this Fruity Bash bag alongside the normal variety, I’d most likely go with this one at least half the time, so I consider it a quality variety. 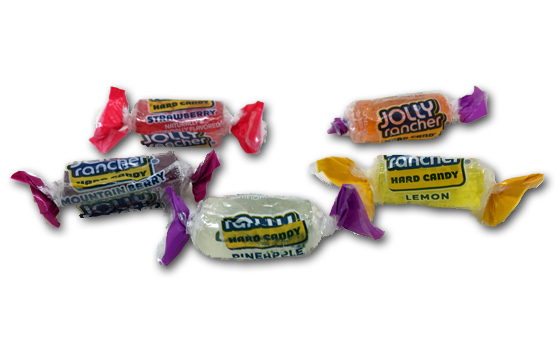 Note to Jolly Rancher: bring back the old flavors! Nice job with this bag, but all you’ve done is whet my appetite. You had me at “…that they’re now sold in bags of just lemon as well.” Wonder if the pineapple’s are, too? Would be worth just getting a bag of each of those. You sure you’re not a guru? Nice taste buds, bud. 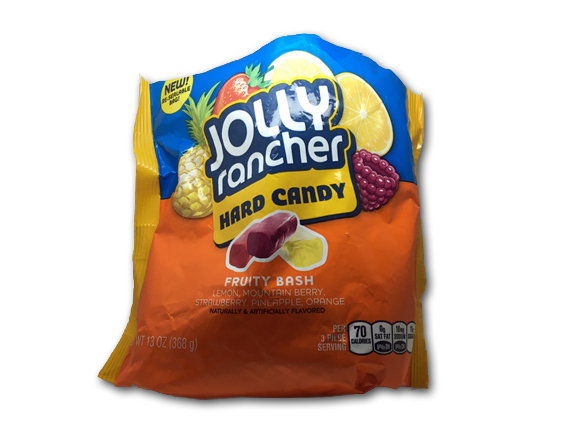 Pineapple – the first clear Jolly Rancher since 2006! There was a clear Jolly Rancher in the “Summer Fusion” mix that was released in 2006 that is not that known about. Love it. Need it, also want it.